Our law firm's founder and senior partner, Lana Hawkins, has 30 years of legal experience. Widely regarded as one of the top family law and trial attorneys in the state, Ms. Hawkins has received numerous awards and honors for her exceptional service and professionalism. 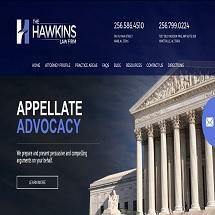 An Alabama native, Ms. Hawkins cares deeply about helping the residents of our state through their most difficult and challenging legal situations. Working with a talented team of experienced attorneys and dedicated staff, Ms. Hawkins and our law firm can help you with virtually any legal challenge you face regardless of the scope or complexity. No matter the legal issue affecting you, your family or your business, you can count on The Hawkins Law Firm for much-needed assistance and support. To find out more about how we can help you in your time of need, you can contact our law firm to schedule a free initial consultation. I called twice and was hung up on twice, in my opinion this isn’t a professionally run business.